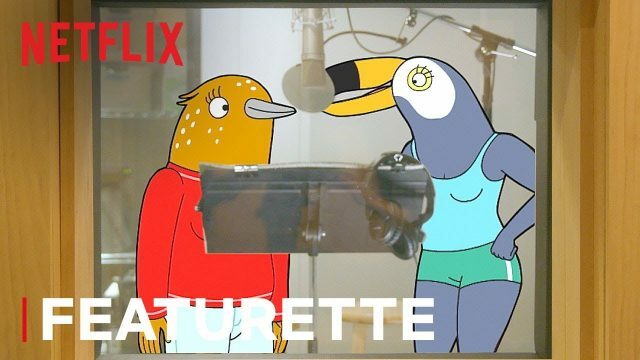 Netflix has released a featurette for their forthcoming animated comedy series Tuca & Bertie, giving us our first look at the team up between Tiffany Haddish and Ali Wong as the titular bird best friends. Season one will be available for streaming on May 3, exclusively on Netflix. Check out the video below! Tuca & Bertie is a comedy about the friendship between two 30-year-old bird women who live in the same apartment building: Tuca, a cocky, care-free toucan, and Bertie, an anxious, daydreaming songbird. Tiffany Haddish will voice Tuca in the series. The adult animated series will also be featuring the voices of Tessa Thompson (Thor: Ragnarok), Amber Ruffin (Late Night with Seth Myers), Nicole Byer (Star vs. the Forces of Evil), Richard E. Grant (Can You Ever Forgive Me? ), John Early (Search Party), Reggie Watts (The Late Late Show with James Corden), Tig Notaro (Transparent) and Jermaine Fowler (Superior Donuts). Lisa Hanawalt (BoJack Horseman) created the series, which consists of 10 episodes for its first season. Hanawalt is an executive producer alongside Raphael Bob-Waksberg (BoJack Horseman), Noel Bright (BoJack Horseman, Friends), Steven A. Cohen (BoJack Horseman, Jack & Bobby) and Haddish. Animation is being done at Shadowmachine. Haddish is best known for her breakout role in comedy film Girls’ Trip. She recently starred in The Lego Movie 2: The Second Part as the voice of Queen Watevra Wa’Nabi. Haddish will next be seen in the upcoming comedy film Limited Partners opposite Rose Byrne and Salma Hayek; in the animated sequel The Secret Life of Pets 2 as the voice of Daisy. Wong has already voiced a lot of animated characters in films and TV shows such as: The Angry Birds Movie as Betty Bird; The Lego Ninjago Movie as General Olivia; and Ralph Breaks the Internet as Felony.